Exacme trampolines are made with strong, rust-resistant galvanized steel tubing, which is safer and longer-lasting than conventional welded trampolines. Galvanized Springs provide a deeper, more exciting bounce. 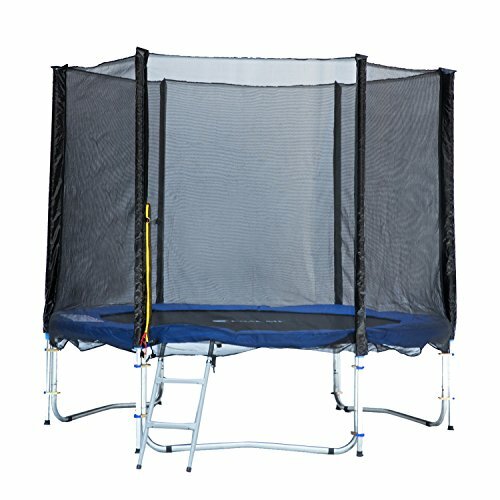 This 6-foot trampoline has a 180 pound maximum weight capacity, is easy to assemble and requires no tools or extra drilling, and meet all ASTM, TUV, and GS quality and safety requirements. A zipper enclosure allows easy in-and-out, the rust-resistant frame will hold up to years of heavy outdoor use. Including:8ft net enclosure, Clamps, Pole pads, and hardware.